Marion F. Mecklenburg and Ross M. Merrill is available for free from the Smithsoninian Institute. Marion F. Mecklenburg and Ross M. Merrill is available for free from the Smithsonian Institute. Synopsis: This technically detailed Handbook focuses on different approaches and procedures that will enable museum specialists (packers, registrars, curators, and conservators) to effectively use the results of the research of specialists in the field. It includes tips and techniques also of relevance to those transporting high value artwork. 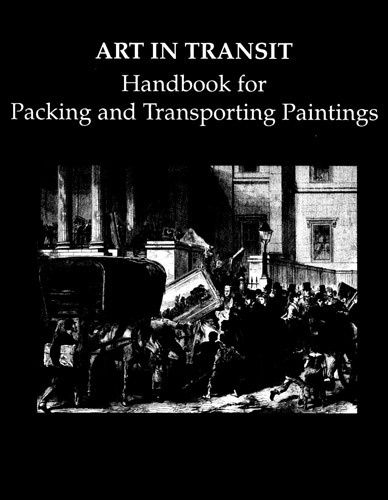 Summary review: If you’ve ever wanted a comprehensive document telling you what to do when packing and transporting artwork, this is a good place to start. Although written for art galleries and museums, there’s a lot of information which will also assist the professional artist who is transporting valuable paintings. Other artists will also find useful information in this large and comprehensive handbook. NOT a quick read.The language may be accessible - but there’s still an awful lot of information. no need to buy - it’s available for free from the Smithsonian Institute (click the title). Hemnes Bookcases - after the carpentry! my two pastel Artbins are demonstrating they can now stack/fit underneath! there is no way you should fill these bookcases full of books without fastening them to the wall. As recommended by IKEA, they need to fastened securely to the wall. Anthea, my carpenter, then also had to make the adjustments for the floor. Over the years the joists have sagged which means that the right hand edge of the bookcase sits on the carpet while the left hand edge sits on a 3/4" block of wood - with the two uprights in the middle on gradated wood blocks inbetween. It's still useful to have the adjustable feet for when I move - and they were very simple to operate even if we didn't put them to the ultimate test in the end! The good news is that after all the adjustments, the three Hemnes bookcases all fitted together perfectly with no gaps. The extra height on the left between the carpet and bookcase has also provided an ideal space for my two pastel artbin boxes which are an awkward size and shape for normal storage! They are also completely rigid and there's no chance of them toppling when pulling out a heavy art book from amongst lots of other heavy books. These IKEA bookcases still feel very solid and reliable for containing all my heavy art books. Each shelf can take a load of up to a maximum of 30 kg of books. Below is a photo taken about half way through the massive exercise of bringing all the art books back. 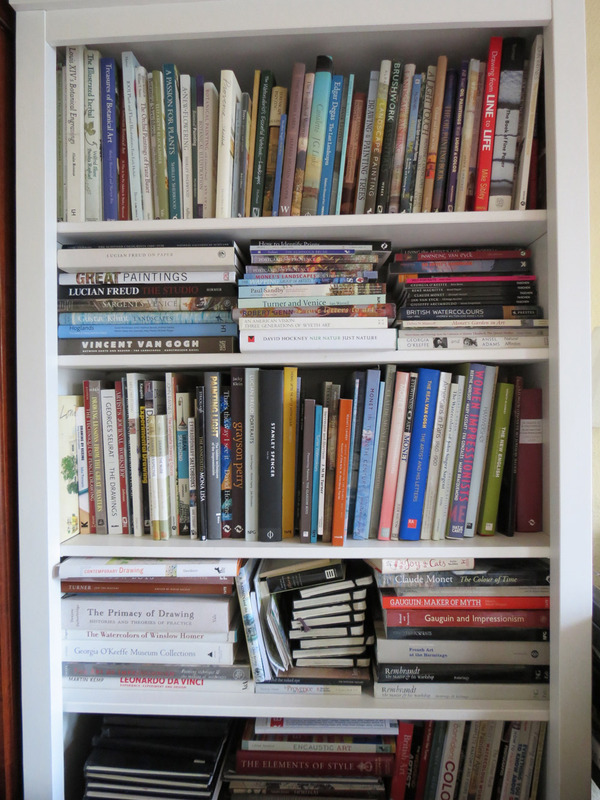 I'm still finishing the organisation of the third bookcase and will take another 'annotated' photo when done. Bonus #1 - depending on how you look at it - is that my cat Cosmo can now jump from his usual perch on top of the door to a brand new high level run from where he can observe everything that's going on. It also provides a launch pad for jumping down on our heads if we sit on the sofa now placed up against the bookcases! Bonus #2 is I think I managed to lose two pounds while hefting heavy art books around the room three times! whether the art books fit! 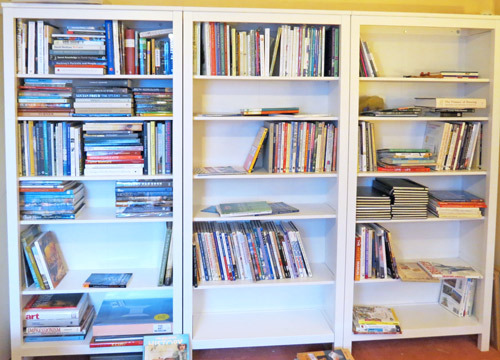 This post follows on from Hemnes Bookcase x 4 for "The Art Library" #1 which shows you what the bookcase looks like without any books. Below you can see the top half of the first of my four new Hemnes Bookcases from IKEA. Three are still in their cardboard packaging and will be erected one at a time over the course of the next week. Three more to construct - was it easy? Yes! If you've got an extensive library of art books like me, then you also need bookcases. 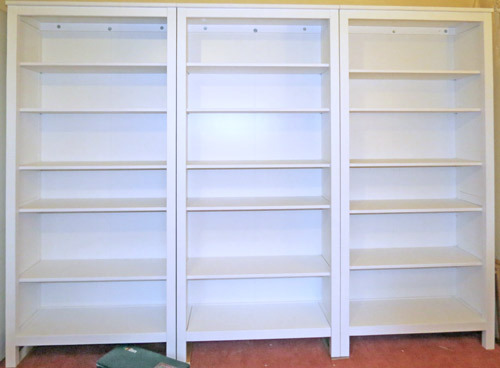 If you're planning to move and/or prefer non-built in bookcases, I highly recommend the IKEA Hemnes Bookcase on the basis of my experience to date. For the reasons why see below. I've lost count of how many art books I have. I just know I ran out of bookcase space a very long time ago. I've also now run out of stacking space on every spare bit of floor and flat space. The thing is stacks fall over. Plus I always want the book at the bottom of the stack. It gets very tedious. So the stacks have to go and so this week I invested in four new bookcases. I'm hoping it will be enough! The bookcases I've bought are the Hemnes 90cm wide bookcase by IKEA. I had originally toyed with building a giant bookcase right across one wall - but this seemed a bit pointless given the plan is to move. The idea is that these painted pine bookcases will give me the most flexible options for the future - and with adjustable legs they give me the best option re 170 year old floorboards right now! This is the pre-assembly blog post. I'm calm - I have a plan of action - and "he who must not be bored while I sketch" is going to help me put them together. If it all goes to plan we should have two assembled, in the right place (after quite a lot of furniture manoeuvring) and full of books by the end of tomorrow. Then it's on to the next two - after a short breather while I write a review of how easy they were to assemble. PS I also bought an Alex storage drawer unit for my art paper. Just trying to work out at the moment whether I've bought the one on castors as intended!